The village was called Crophille in Domesday, but there was no mention of a church. 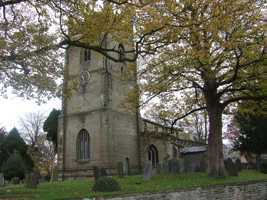 The church is thought to date from the transitional period and consists of a chancel, nave, north and south aisles, south porch and c1450 ashlared Perpendicular west tower with a double decorative frieze, crenellated parapet and corner pinnacles. Four arches on low circular piers divide the aisles from the nave. Although the north arcade is slightly earlier than that on the south, both are 13th century. In the north aisle a section of 13th century wall plate can be found with nail head ornament, and a round-headed window preserved in the north aisle wall. The other windows are mostly 14th century, including stained glass of a standing bearded figure in the north aisle east window. The clerestories are 15th century. The chancel is early 14th century with a three-light east window of the ogee-reticulated type. In the chancel is a piscina, and an aumbry to hold sacred vessels for the celebration of the Mass. The decorated early 14th century octagonal font has a cover dated 1662. The 16th century Perpendicular nave roof is described by Pevsner as ‘good’, and is elaborately moulded featuring carved bosses depicting monsters’ heads. The oak benches in the chancel have poppy heads and moulded back rails and may date to the 15th or 16th century. The tower, some 60 feet in height, contains a clock installed in 1907, and six bells, four cast in 1618, a fifth installed in 1906, with a sixth being added in 1981. The chancel was restored in 1854 and additional repairs to the roof carried out in 1873. In 1894 the church was re-seated and a new pulpit, reading desk, and lamps installed.